The gypsy is a nomad. The inca is a leader. As baby Kai’s First Birthday began approaching I began feeling like myself more and more. As much as it’s been a wonderful year it has been hard work and a lot of adjustments have been made since I gained a new title under my purpose in this world. 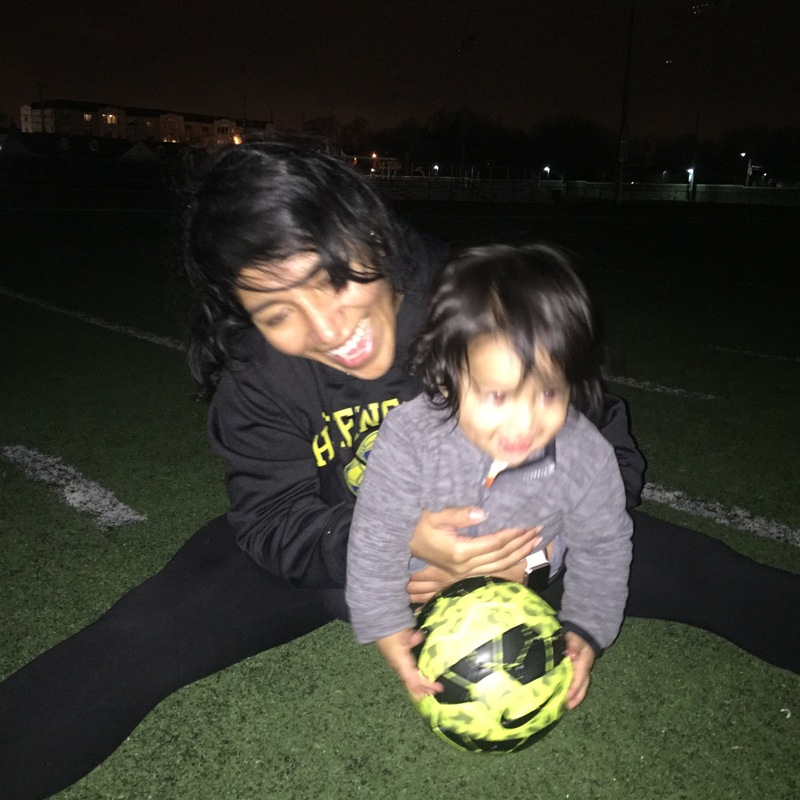 So, I began putting my vision board into action; running, better eating (I was eating to produce as much breastmilk as possible for Izkai: my goal was 12 months of breastfeeding), soccer again, and producing more blogging content. What was my easiest goal to start with? Soccer for sure. I immediately signed with the team I’ve played in a state league with; success! I would definitely be a little out of shape but it’s the sport I can naturally adapt to while having fun. Plus, now Izkai could be rolling and running around on the side while I played. My first game comes along and I go fully prepared to play, along with my lovely knee brace that I’m required to wear by my doctor & Mark after my two knee repairs. It was a great day for soccer and I had my two favorite boys with me. As I began playing I felt, what would be the perfect word?, “alive”; I felt alive on the field. I felt more like myself than I’ve felt in about two years. Yes, Izkai was turning One but let’s not forget all those months of pregnancy that have kept me away from playing with physical contact. Everything was going smoothly until a foul play by an opponent made my brace and I go down and it was topped with a “pop” and immobility. Yea we all know what that “pop” means, but you always walk away to R-I-C-E* and wait for that MRI. That MRI was not pretty and full of bad news. My ACL graft had detached, my MCL was torn, and my meniscus will need some reparation. What about my vision board? Blogging content and better eating was still possible (after I binge on some ice cream due to the bad news of course) and I was going to figure it out how to accept a different type of cardio to replace running. After some memory back pedaling to my many rehabs and researching, I come to remember how able I was to run right before my past surgeries. The following are a few steps that’ll get you ready to face any setbacks that you may come across. Understanding adversity is the root of the character that you will come to reveal. Adversity is a state or instance of serious difficulty or misfortune. How to come to understand the unforeseen when you have all of these plans that you are determined to put into action? Breathe. Although it sounds cliche everything really does happen for a reason. Accept it but don’t go searching for the reasons why it happened, invest your time to find a solution. Solutions not only make situations better, they make you better. You have now become a problem solver, an analyst, an observer, and time manager. All of these new actions that weren’t on your vision board have now surfaced. Patience: bearing your pains without complain and with a lot of calmness. Remember, your best self will take time and if you’re going to have a surgery performed on you to “fix” an injury then you want to come out better than how you went in. It’s not easy to sit around waiting for results that may never happen but if instead of sitting we focus on giving everything during the process, the results will come and they will be gratifying. The most successful don’t ever look back and preach about their talents but they do mention their passion and their dedication. Commit yourself to your preparation, commit, because no one else will but you. At the end of it all you cannot be upset with results you didn’t get with the work you didn’t do. Positive vibes: ever admire those people that just make the room better by just being present? ; it’s energy, positive energy. You now have downtime or time to ponder about the what ifs so use that time wisely and work on becoming that person that will make the room better because you will be alone with yourself in that room while you’re recovering. Be the fountain not the drain, I repeat, be the fountain not the drain. Seeing the good in everything requires training in itself and since you play the way you practice, make sure you show up with positive vibes. I have been working first and foremost on stability. Being sure that I am ok with my own weight, going up & down stairs, and walking properly is very important especially since I do have a one year old. That took a few week after my injury to accomplish and it was a rough “still” ride. I am now attempting strengthening exercises that seem very basic but for someone that hasn’t done anything in months soreness is present and it feels good. My goals are to cycle comfortably and perform leg workouts with some weight before surgery. All the running I am working towards is chasing after a walking baby which isn’t close to a half marathon but it will add on to my daily step count. A little progress every day adds up to big results so make good use of your time since it’s going to pass by anyway.